Sophisticated well beyond its muscle-car heritage, the rear-wheel-drive 2018 Chevrolet Camaro is more mature than its predecessors with increased refinement and a turbocharged 4-cylinder engine making 275 horsepower. Relax, the Camaro still packs the muscle; optional V8s deliver as much as 650 horsepower. Available as a coupe or convertible, the Camaro rivals the Ford Mustang and Dodge Challenger. Finally being able to purchase the my dream car. The Chevy camaro. We just got the camaro. The car is very clean very fast has all of the up to date fun extras that I think every car should have. The bad points are only that there is not a lot of room in the back for adults to sit and be comfortable. There is not much leg room in the back. There is lots of room in the front and in the trunk has lots of space. The car handles like a dream. It is really easy to drive and is super smooth. It is so far it is great on gas mileage in town and on the freeway. And so far seems to be a very reliable vehicle for us. We can go on long trips or short ones and be super comfortable and know that we're gonna make it there and be safe. Yes, the Chevy Camaro is a good sports car. It has great handling and a lineup of powerful engines that make it one of the strongest all-around performers in the class. In addition, it has comfortable front seats and easy-to-use technology. The Camaro's tiny rear seat and trunk make it less practical as a daily driver, but neither is out-of-place in a sports car. The Chevy Camaro is a great choice if you want a sports car for weekend cruising. However, if you're looking for an everyday vehicle, you should shop around before making your decision. Not only does the Ford Mustang deliver similar performance as the Camaro, but it has more trunk space and a nicer cabin as well. The Dodge Challenger doesn't handle as well as the Chevy, but it has a ton of power and more passenger and cargo space. A good car that does what it needs. I enjoy my car it does what it needs to. It provides me with what I need and hasn't had any significant problems yet and it's a crowd pleaser. It's a bit small for me but that's not a problem for most people considering I am a large guy. I'd recommend it to people if they have the money. Its daily drivable which is good but for the money I feel it would be smarter to have a separate daily driver and a separate car for fun. The BEST under $50K? 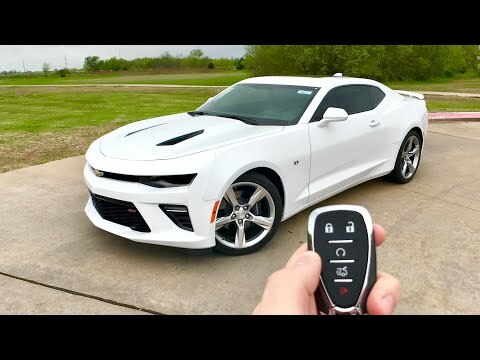 2018 Chevrolet Camaro 2SS | Full Review, Exhaust, Test Drive!